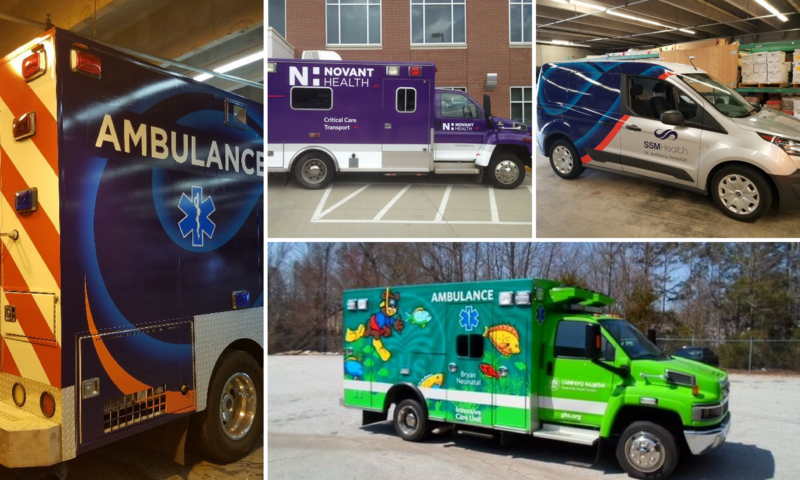 What types of vehicles might be involved in your healthcare system’s rebranding or graphic wrap program? When thinking about the type of wrap or graphic, consider the visibility of each type of vehicle. Will the public see these vans, buses and shuttles on the road, or not? The less visible vehicles, like facility trucks, should get more minimal branding. 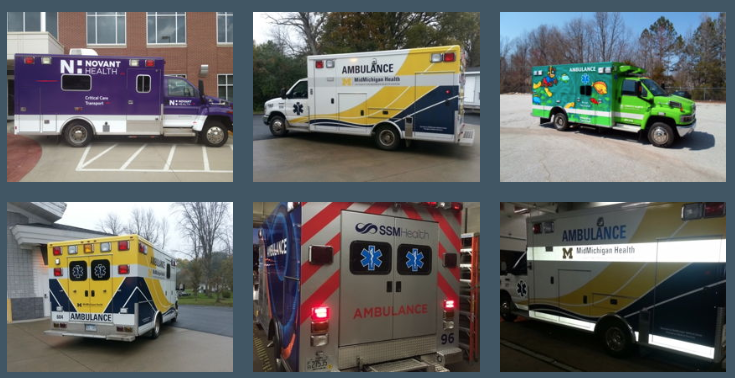 Vehicles that carry patients or get more road time around the community should be prioritized for more involved graphics; this includes partial wraps and full wraps for the purpose of catching “more eyeballs.” In this way, we help you get the best impact while keeping costs down. What do you need to gather for your print partner before you start a new project, like a rebrand? Your printer should be able to guide you through the steps and give you a checklist of assets you need to collect. They’ll ask for photography, graphics, logo files, vehicle specs, inventory details, and more. Each state has different requirements for the graphics on emergency vehicles. Some require specific reflective markings on sides and/or rears of vehicles. In general, most wraps for emergency vehicles will involve reflective graphics. Our Transportation division has created a variety of reflective graphics for rear reflective chevron stripes — yellow, red, or the color of the client’s brand. We work with clients and their legal teams to determine the kinds of graphics that will meet state requirements and keep healthcare companies in compliance. Star of Life - The Star of Life is a blue, six-pointed star, outlined with a white border and usually featuring the Rod of Asclepius in the center. The symbol was originally designed and governed by the U.S. National Highway Traffic Safety Administration (NHTSA) under the jurisdiction of the United States Department of Transportation, DOT). It has become a symbol of the emergency medical services in multiple countries. “AMBULANCE” - The size of the ‘AMBULANCE’ text on units is a factor. This text has to be visible and obvious. Reverse “AMBULANCE” - Consider requirements for the word “AMBULANCE” to appear on the hood of the vehicle, for the purpose of drivers seeing it in rear view mirrors. 3M Red (973-72 NL Flexible) & 3M Florescent Yellow (973-71 Flexible) – Both are sometimes used on the rear in a chevron pattern. These are ‘specialty’ materials from 3M that are specifically used for emergency vehicles in which enhanced visibility is needed. You come to us with existing knowledge of your fleet. We help you gather the appropriate information for a rebranding project. Our art team creates concepts for the vehicles. Your team reviews, makes tweaks and revisions. We collaborate to make sure you are creating the best impact across your fleet and with your budget in mind. Once orders are in production and we are ready to schedule installations, our project management team works with site contacts to build a schedule that works for you and gets the vehicles back on the road as quickly as possible. We use installation crews who are highly trained, flexible, and familiar with reflective vinyl and hospital fleets. Our project management team monitors overall progress and keeps reports of daily wrap completions. When comparing print partners, use this checklist. Does your print partner offer the following services, experience and capabilities? The Transportation division of The Vomela Companies is a trusted partner for large healthcare conglomerates, as well as small to mid-size healthcare companies. Does your re-branding project include graphics for a dozen or even hundreds of vehicles, with tight deadlines and complicated rollouts? Contact us today to learn how The Vomela Companies can help.